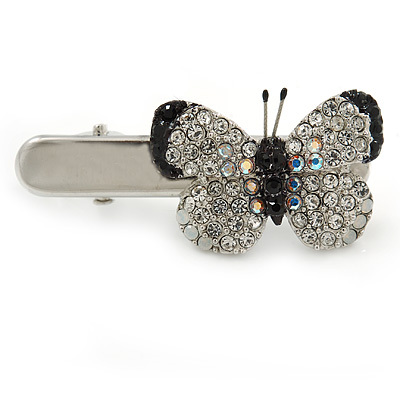 Put the perfect finishing touch to your look with this crystal butterfly hair beak clip. Featuring a small hair concord clip, crafted in silver plated metal and decorated with a butterfly motif. The butterfly pave set with sparkling Austrian crystals in hues of clear and black. The butterfly motif measure about 17mm L x 23mm W.
The clip has about 37mm L in total.